One major source of conflict comes with the professional advisors that drive the deals. Since long term leases involve so much money and are so complex, they require millions of dollars of services from investment banks, lawyers, financial advisors, etc. Unlike for typical government transactions such as issuing bonds or contracting out services like printing, building maintenance, or call centers, for which cities have some experience, the vast majority of cities have little in house expertise for complex financial transactions. Thus local officials are at the mercy of these out of town experts to give them the best advice they need to defend the public's interest. But what advice can we expect from these firms, who have a stake on highly leveraged deals? The people in the firm may be technically competent and possess the highest levels of personal integrity, but still are prisoners of a structural conflict of interest in promoting privatization transactions. Consider Morgan Stanley. An arm of Morgan Stanley was the winning bidder on the Chicago parking meter lease. That deal is widely seen as a disaster, giving the idea privatizing meters a black eye, and engendering such headlines as “Morgan Stanley's $11 billion makes Chicago taxpayers cry (Bloomberg) and “Company [Morgan Stanley] Piles Up Profits from City's Parking Meter Deal” (NY Times). Now Morgan Stanley is back, this time advising Pittsburgh and Indianapolis on potential parking meter privatizations. Morgan Stanley has a huge structural incentive to want those deals to go through. 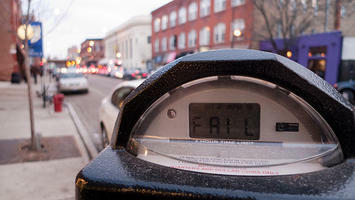 It would restart the market for parking meter privatization, and position the firm as the preferred advisor to cities. Even where they were not the city's advisor, a restarted parking meter market means they could potentially bid on many more assets. If you make money on privatization transactions, then no deals means no money. So obviously these firms have every reason in the world to promote privatization and see deals go through regardless of whether any particular deal is good or not. This doesn't mean they are crooks, it's just the reality. These firms now form of the core of the “privatization-industrial complex” with an incentive to cheerlead for leading public assets because that's how they make their money. They need deal flow, the more transactions the better. This was picked up on by Harrisburg, PA. Facing bankruptcy, the state offered an $850K grant to hire Scott Balice Strategies of Chicago, one of the nation's top privatization financial advisors. The city council turned it down. As one city councilor noted, “Their recommendation is always the same: 'sell assets'”. Many of these investment banks, operators, financial advisers, and law firms also have tight links with each other, and participate on deals together, often as partners, other times as opponents. The Pittsburgh Post-Gazette noted how many of these firms have ties to Chicago’s earlier round of privatization. “When Pittsburgh proposed leasing its public parking facilities, the city became a magnet for a passel of firms – many of them connected to Chicago by blood, politics or business – that pursues similar deals around the country. The firms may be partners in one city, rivals or referees in the next.” The winning bidder on the Pittsburgh parking transaction is actually Morgan Stanley's partner in the Chicago deal, for example. These potential conflicts make it very difficult for cities to know they are making a good deal, especially since they lack the experience necessary to independently judge it. Right now, they often are at the mercy of their advisors. And ask yourself this: when was the last time a city or state looked seriously at one of these deals and their advisors told them not to do it? This is frequently combined with traditional clout driven contracting. Many of the Chicago parking meter firms had tight links to the Daley administration. Similarly, in Indianapolis a city-paid chief advisor to the office of the mayor is conveniently also a registered lobbyist for the winning bidder. This combination is a recipe for disaster, resulting in very long term deals that could be very bad for the public. Submitted by tofifi08 on Wed, 05/13/2015 - 19:34. Submitted by david watson on Thu, 05/07/2015 - 05:55. Submitted by xijozx1122 on Thu, 05/07/2015 - 05:41. Submitted by johnz308 on Fri, 05/01/2015 - 11:00. Submitted by zac1 on Sat, 04/25/2015 - 06:59. Submitted by xahgzr1122 on Sun, 04/19/2015 - 07:28. Submitted by johnz308 on Fri, 04/17/2015 - 03:36. Submitted by xijozx1122 on Sat, 04/11/2015 - 03:07. Submitted by johnz308 on Fri, 04/10/2015 - 02:05. Submitted by johnz308 on Tue, 03/31/2015 - 13:23.